A team of researchers has detected all phases of thermonuclear burning in a neutron star located close to the center of the galaxy in the globular cluster Terzan 5. They analyzed X-ray observations from NASA’s Rossi X-ray Timing Explorer (RXTE) satellite and discovered that while this star follows model predictions, rotation may affect thermonuclear burning and needs to be further researched. Neutron stars typically arise from the collapse of massive stars. These stellar remnants are made almost entirely of neutrons, and are incredibly dense — about the mass of the sun, but squeezed into a sphere just a few miles wide. For the past three decades, astrophysicists have studied neutron stars to understand how ultradense matter behaves. 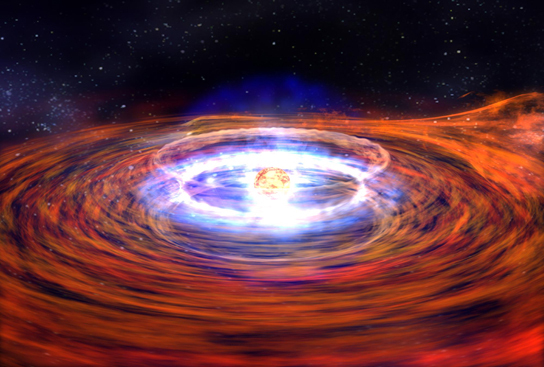 In particular, researchers have focused on the extremely volatile surfaces of neutron stars. In a process called accretion, white-hot plasma pulled from a neighboring star rains down on the surface of a neutron star with incredible force — equivalent to 100 kilograms (220 pounds) of matter slamming into an area the size of a coin every second. As more plasma falls, it forms a layer of fuel on the neutron star’s surface that builds to a certain level, then explodes in a thermonuclear fusion reaction. This explosion can be detected as X-rays in space: The bigger the explosion, the greater the X-ray intensity, which can be measured as a spike in satellite data. Researchers have developed models to predict how a neutron star should burst, based on how much plasma the star is attracting to its surface. For example, as more and more plasma falls on a neutron star, explosions should occur more frequently, resulting in more X-ray spikes. Models have predicted that at the highest mass-accretion rates, plasma falls at such a high rate that thermonuclear fusion is stable, and occurs continuously, without giant explosions. However, in the last several decades, X-ray observations from nearly 100 exploding neutron stars have failed to validate these theoretical predictions. In late 2010, the RXTE satellite detected X-ray spikes from a binary star system — two stars bound by gravity and orbiting close to each other — in Terzan 5. Linares and his colleagues obtained data from the satellite and analyzed the data for characteristic spikes. The team found the system’s neutron star indeed exhibited X-ray patterns consistent with low mass-accretion rates, in which plasma fell to the surface slowly. These patterns looked like large spikes in the data, separated by long periods of little activity. To their surprise, the researchers found evidence for higher mass-accretion rates, where more plasma falls more frequently — but in these cases, the X-ray data showed smaller spikes, spaced much closer together. Even higher still, the data seemed to even out, looking more like an oscillating wave. Linares interpreted this last observation as a sign of marginally stable burning: a stage where a neutron star attracts plasma to its surface at such a high rate that nuclear fusion reactions take place evenly throughout the plasma layer, without exhibiting large explosions or spikes. The team soon identified a possible explanation by comparing the neutron star with others that have been studied in the past. The one big difference they found was that the neutron star in question exhibited a much slower rate of rotation. While most neutron stars rotate a dizzying 200 to 600 times per second, this new star rotated much more slowly, at 11 rotations per second. The group reasoned that in predicting bursting behavior, existing models have failed to account for a star’s period of rotation. The reason this new star matches models so well, Linares says, is because its rate of rotation is almost negligible. It’s still unclear exactly how rotation affects thermonuclear burning, although Linares has a hunch: Rotation can cause friction between layers of plasma and a neutron star’s surface. This friction can release heat, which in turn can affect the rate of nuclear burning. Coleman Miller, professor of astronomy at the University of Maryland, agrees that rotation may be the most significant factor that models have overlooked. However, he says designing models with rotation in mind is an incredibly data-intensive feat, since thermonuclear fusion often occurs incredibly quickly, in tiny pockets of a neutron star. Be the first to comment on "Researchers Detect All Phases of Thermonuclear Burning in a Neutron Star"